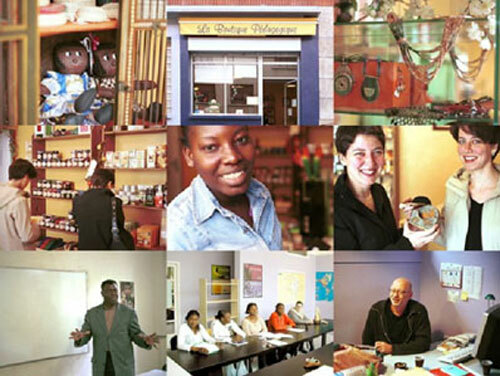 A pedagogical shop, providing an alternative training system and promoting fair trade. The project was founded (in 2001) and run by Marcel Finders and the association TEREM (“territoire et emploi”), created in 1992, whose plan was to create the opportunity for young people to go on exchange in Europe but evolved to provide (re)integration into professional life. The aim was to make both young people and adults who are either unemployed or not adapted in coping with a conventional mode of education (and those who have never been to school e.g. immigrants) find fulfilment through work. In Paris the pedagogical shops are installed in the areas known as sensible in order to have a local action. The drivers of the solution are mostly social and economic: social because the main users regain confidence as actors of the social life; economics because people in need can live decently either the students or the producers of the fair trade products sold in the shop which are paid to the real price for their production. The pedagogical shop on the “28 rue des Maraîchers” in the 20th “arrondissement” of Paris is composed of two classrooms, two offices, a stock and a shop. One of the offices is for administrative matters and the other is for the pedagogical director Marc Lasuy and Clotilde Chansioux in charge of the relations with companies. To participate, the student has first to have his personal motivation to go to the “A.N.P.E” they are then sent to the “mission locale” and there they research the best orientation for this person.The training begins, it will last 4 months with 3 weeks dedicated to internship. In 2003, about 200 students have been in the pedagogical shop. The system of the pedagogical shop is: the students come in the morning for their courses, one of the students has to open the shop, every two hours the students will take turns in the shop.The students are surrounded by a solid structure during the training, they have to be present on time there and they are followed by the team. The “fond social européen” financially supports the solution for the three first years. The pedagogical shop is recognised as a training center and is paid by “le conseil regional de Paris” for each student under 26 years old and by the “DDTEFP” for the older students. They receive money from private structures. All the money earned by the sales of the products goes to the fair trade producers. The human contacts are an important part in the reintegration process: by belonging to a group, meeting people (customers, professionals…) the students open themselves to the others. The fact that the pedagogical shop entrusts responsibilities to the students gives them the necessary self-confidence to succeed. The shop only sells fair trade products and that enhances the image of this system, it enables people either to discover the products and participate by buying them or even to encourage other people or shop to develop this system. The shop has no direct benefits for the environment but the fact that all the elements are in the same place avoids a lot of transportation and could be a source of environmental benefit. Indirectly the fair trade supports the local agriculture, which allows the small farmers to earn their living and to work in harmony with the earth. Being an association “loi 1901” the pedagogical shop has no commercial aim and has no right to be in competition with the local trade. The everyday customer frequency is around ten but is constantly increasing, thanks to the media, to the development of consumers’ loyalty and to the mouth to mouth. The association has increased of 60% its income in 2003, which is reinvested in the structure. It’s a beneficial solution for the producers, they are paid the right price for their work.